Through various forms of research, education, and trusted resources, we typically strive to follow a form of an alternative natural philosophy of medicine. Overall, that is a type of preventative care through living a life seeking ‘health & wellness’ through nutrition and a healthy, active lifestyle. So, typically speaking, we are on the conservative side in regards to intervention, however, we DO believe in and appreciate modern medicine when it is a need. So: HELLO, and here we are! We are told we are about to bring a baby into this world that will have very high needs. Honestly, I think initially I was pretty naive to the extent of Elias’ predicted birth defects, and even wanted to stay that way. I may even have been in a state of denial~ and sometimes I still can be. According to our doctors current descriptions, this is “as serious as it gets”. Elias is diagnosed to have a NTD (Neural Tube Defect). There are various types, but in his case, this is when part of his spine did not close up as he was being formed (usually around 4 weeks). When this occurs, it can potentially grow protruding outside of the skin. It also commonly leads to a brain defect because of the location the spine and brain connect, and it will cause a “pull”. This led to what was noticed in the ultrasound- Chiari-Malformation, and the shape of his brain being abnormal. Detecting these concerns is still inconclusive results for anyone, because during the entire growth of the baby in the womb, there is no way to know the extent of potential nerve damage or even cognitive/physical brain effects. A few months ago, we saw our first specialist, Dr. E. He is very matter of fact and to the point. I did feel that there was a lot of room for hope with the vague diagnosis, but I also knew it was serious and would most likely need immediate pediatric intervention, being hospital care and surgery on his spine. We saw this Dr. twice to verify findings and follow-up. I asked Dr. E if I could still have a natural delivery vs. a cesarean, and he said he saw no problem. Soon after, we chose to transfer our care to having a Midwife team as a “happy medium” for the transition to being in a hospital setting as opposed to our previous two home births. I met with the midwives and had an immediate source of comfort and rapport for their like-minded view of labor. At this new location, they collaborate care with a team of OB’s and specialists for high-risk cases like ours. Things were still hard, but at least there were some comforts along the way. Dr. C – 1st Appt. Two months ago (June), things started to get more intense and uphill for us to take in. This was when I met with our 2nd and current specialist, Dr. C.
Elias’s brain fluid began to noticeably start increasing (hydrocephalus). This is common for 90% of babies with spinal defects. Doctors were not alarmed, but Dr. C was VERY clear that this was going to be intense and he would most likely need brain surgery shortly after his birth. This was hard news to hear: not one surgery (Spine), but two were now on the horizon. 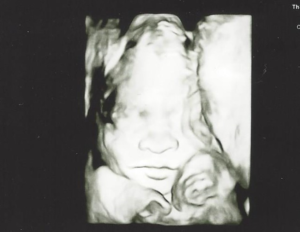 The 2nd appointment/ultrasound with Dr. C made things even more intense (July). My OB and her assistant came in and basically, to put it nicely, bull-dozed ANY ideas that I thought may play a part in our upcoming labor. They TOLD me that I had to have a c-section, I could not have midwives any more, and that a lot of things I had been doing were no longer ok (natural forms of prenatal care). Brandon & I were pretty dumbfounded, and even though we asked questions,.. they were firm in their prescription for care. I was very sick after hearing this news. I already have been struggling with physical anxiety like never before, but definitely had to take a week away from the world to just breathe. I will just say that during these challenging times, God has given us so much grace- my daughters have been so sweet during this time. I am so thankful for the joy that they have reminded us of each day/moment. I KNOW it will all be worth it, but not gonna lie… it is just plain hard a lot of the time! The Lord is faithful to get us through one day at a time. After that appointment in July, I was sort of in a tale-spin and began researching like CRAZY and contacting all trusted resources in this field that I knew. I don’t understand why Dr.’s didn’t just commonly refer to Elias’ condition as Spina Bifida, but it is. Apparently, some Dr.’s don’t label it until the child’s actual birth. As I researched, I still have found a lot of mixed evidence, but I have been encouraged that it doesn’t just HAVE to be delivered a certain way. There are a lot of risks in this labor, period. C-section or not. I am now comforted and convinced that for our family, pursuing a natural delivery is going to Elias’s best chance to fully thrive. Obviously, there is always a chance of an emergency c-section last minute- this is something that I will leave in God’s hands. I do not, however, want to choose a c-section for convenience or to help comfort Dr.’s for their fear of liability. During the time between this research and my NEXT appointment (August), I had two very encouraging calls from two mid-wives. One just to give us complete support and confidence in our decisions. The other gave us HUGE medically supported information that she spoke with another specialist on the team (MFM Dr.) who spoke with our Pediatric Neurosurgeon (Dr. B) who confirmed that we could indeed have a natural delivery if we chose, and it carries out very similar risks. I was able to take this information to Dr. C at our next appointment. That was this week. Dr. C seemed to expect our firmness and responded with understanding and approval that a natural delivery could be fine, but she was concerned with the timing and care that would be available. We assured her that we still believed it would be worth it. She also shared with us an updated report that Elias’s brain fluid had continued to increase 🙁 , so, we would be monitoring it to see if it continued to in an “alarming” manner. It’s not there yet, but increasing is still not good in any way. This part of the story is where we are at! … and it is soon to be continued. We are about 5 weeks from Elias’s due date, and chances are high that this little guy may come early due to a medical need. This week was very hard thinking through the potential outcomes and decisions. Though it is tough, we do not doubt God will work it out and it will be worth it. But it is still just hard. It feels like a burden, and so it keeps us in a constant place of dependency on the Lord’s strength and hope. **We DO believe that God is a God of miracles. He can fully heal Elias before or after his birth. ** We would appreciate any and all prayers for us to trust the Lord for whatever He allows! If God doesn’t heal Elias immediately, we still believe and trust Him to get us through and allow these trials to be opportunities for many things that may have never been. Thank you for even taking the time to read and know how you can pray for our family! Thanks again for sharing this journey with us. We love you all and lift up your requests daily trusting that our Lord will be faithful to see you thru every step of the way. God only knows, but He is a God of miracles and like you said, no matter what happens, he has a purpose for it all. You guys represent a profound trust and faith in Him. We are walking through this with you dear friends. Love and prayers!! So sorry to hear of this news but also so moved by your faith and assurance in the Lord. We actually just found out a couple weeks ago that Elijah (our son who is now three years old) has a Chiari Malformation. You probably know more information that I do about it, but just know I understand the anxiety surrounding that diagnosis. We are praying for complete healing!! You and your family are in my prayers! I can’t imagine how you are feeling just now. Just know that we are all sending you guys and Little Elias ourlove and prayers. Your are a strong woman of faith and love-God is in your corner! All your children are bless to have you (proverbs 31:10-31). Love you girl! I am so sorry you are going through this Krystal, it sounds very stressful and overwhelming. May God’s peace and wisdom guide you! Thank you for being so transparent in sharing this journey with us. Please know that our love and prayers are with you, Brandon and Elias. Love you, Krystal! Praying, Praying for you and baby Elias! !